Chris Wilder believes John-Joe O’Toole’s performance at Tranmere Rovers was proof that the midfielder has the right attitude to prolong his Cobblers career. O’Toole was sent on loan to Saturday’s opponents Southend United and played twice for the Blues - once against Northampton - before being recalled to Sixfields. He turned in an eye-catching display in the 2-1 defeat at Prenton Park and drew glowing praise from his manager for the contribution he made in midfield. “I’m delighted with the way he has played since he’s been back and I have to say the support he got from our punters at Tranmere was great,” he said. “They were singing his name right the way through and that tells its own story. His attitude has been great and long may that continue. “We signed John-Joe ahead of a lot of other clubs and we want him to be a success so that’s a good step in the right direction for him. O’Toole should keep his place in the Town line-up for the visit of Southend, a team with whom he was training less than a fortnight ago. 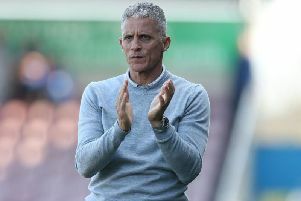 The Blues are sixth in Sky Bet League Two, 15 points clear of the Cobblers, but Wilder is confident this will be the weekend his team finally end a run of five successive losses. “They’re up there on merit but we have to believe the next game is the one that gets us going again,” he said. “We can win, we have to believe that and a month ago there was nothing in the game until we gave away a penalty. “All of the games during this run have been tight and they all could have gone either way but we know we need to give our fans a boost.